In Guangzhou you can’t help reading about the Lingnan style of architecture, without learning much. The old classical Lingnan style was built around the structure of life of those times. The high-rises of today are the same across all of China. When you try to find out more about the modern Lingnan style you are referred to examples: the Chen Clan Academy or the lobby of the White Swan Hotel in Shamian island. What I understood was that the Lingnan architectural style referred to adaptations to the warmer climate of southern China, including the materials used. 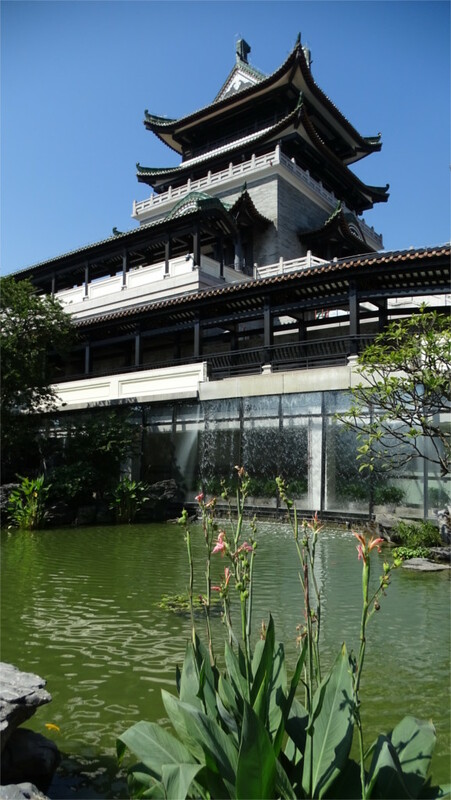 As an example, the open verandahs of the Museum of Cantonese Opera that you see in the featured photo channel air over water to cool the surroundings. I walked through the museum asking myself whether I could think of it as an example of the modern Lingnan style of architecture. The wood and clay tiles that are used in these roofs could possibly count. The clay tiles insulate against heat. 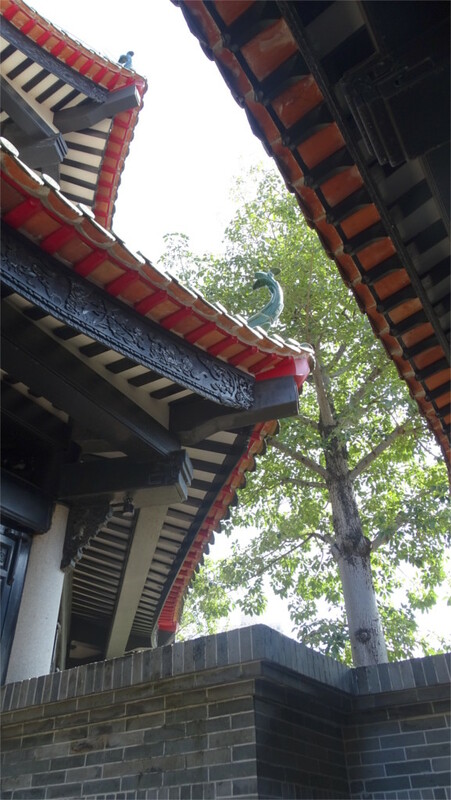 The decorative fired black clay panels just below the roof are holdovers from older Lingnan architecture. So this combination would count as Lingnan. 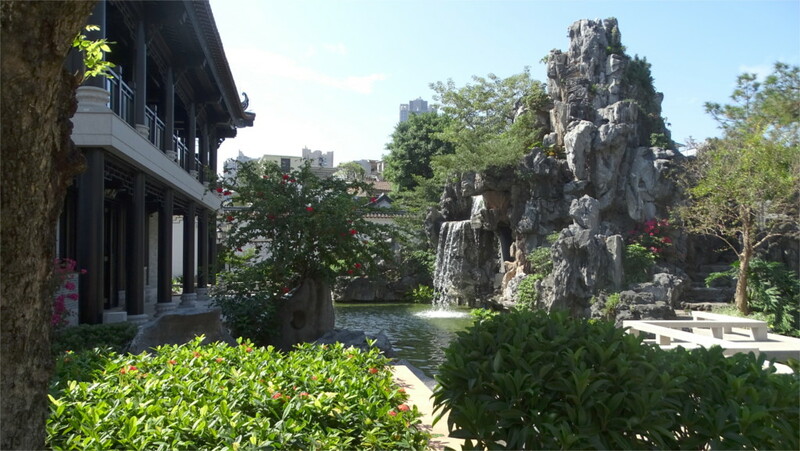 The large pool and the cascading water from the rocks in the middle of it are definitely in the Lingnan style. Chinese gardens from across the country use water and rocks, but such a large open pool, not shaded by trees, is unlikely to be seen in Shanghai or Beijing. Pools there reflect the greenery of large overhanging trees. This one does not have the feel of the pools and streams in the Summer Palace of Beijing or in Shanghai’s Yu garden. This part of the complex induced a sudden sharp burst of nostalgia. 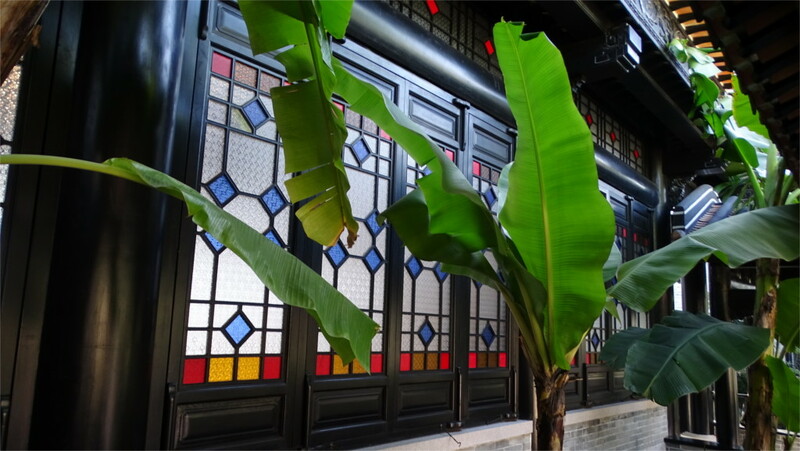 The banana trees and the coloured glass panels in windows reminded me of one of my childhood homes. The combination of hot-climate plant and glass designed to block out the sun would definitely make this part of the vocabulary of the Lingnan style. In fact, walking around the neighbourhood you can see many more examples of these glass panels on doors and windows. 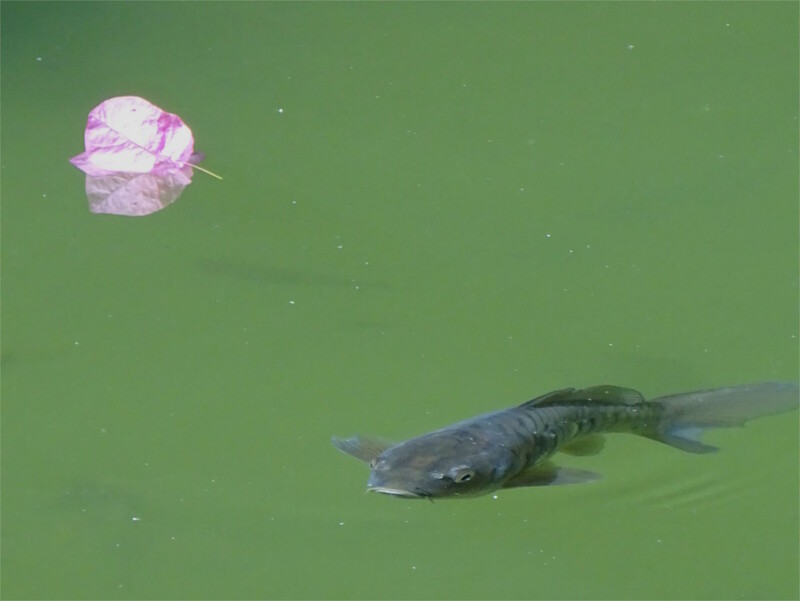 A Bougainvillea flower floated on a stream full of carp. This was again typical of Guangdong and Guangxi provinces. This plant does not grow well in the cold of China to the north of these provinces. In fact when we flew in to Guangzhou, the sight of Bougainvillea growing in the city made me think of the balcony of our flat in Mumbai where we have managed to get two of these plants to grow. The carp is common across China, so between the two, this is a Lingnan voice speaking. The building above the museum has a tower with the upturned corners which some people say typifies this style. I also liked the adaptation of modernity in the simple rectangular glass windows. They would not be out of place transplanted to the Barcelona Pavilion. The building stands next to the pool whose photo you saw above. So, together, they take modernity and Lingnan’s old architectural vocabulary and merge them together.